I am participating in a VIN campaign for TracFone. I am receiving a fee for posting; however, the opinions expressed in this post are my own. 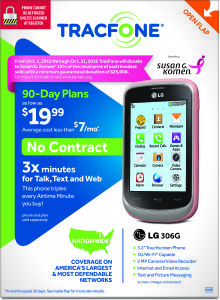 I am in no way affiliated with TracFone and do not earn a commission or percent of sales. Breast Cancer has touched so many of us in one way, shape, or form. For me it was via a co-worker I’d worked with for ten years. Watching her go through the diagnosis, treatment, and recovery process was hard…but it was also inspiring. Instead of worrying about her own feelings and comforts, she was constantly thinking of others, worried that she was putting them out, and other such things like that (oy vey!). But she was also really put through the wringer. It’s not something I would wish to anyone. I am very, very happy to tell you that her story had a happy ending, thanks to early detection. Not everyone is so lucky. The Susan G. Komen Foundation and TracFone have partnered up yet again (this is the sixth year running) to work towards finding a cure. TracFone, one of America’s leading no-contract cell phone service providers, has agreed to donate a minimum of $25,000 this time around, which I think is amazing, and you can help! 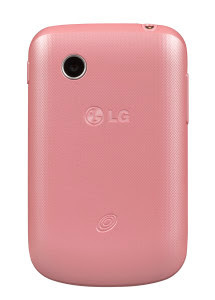 Simply purchase a TracFone Pink LG306 from any Dollar General store or online at DG.com and you are doing your part. Airtime service plan is required for activation. Cool, right? And easy! TracFone provides their customers with nationwide coverage on America’s largest and most dependable networks. With no activation or cancellation fees, you can change your no-contract plan as often as your needs change, without penalties. And one of my favorite things about TracFone is that they are the only no-contract cell phone service provider to offerUnlimited Carryover®, , allowing customers to keep unused minutes, text and data as long as the cell phone service is active and in use within any six month period. TracFone phones and airtime service plans are available at more than 100,000 retail locations nationwide. The ninety-day plans start out as low as $19.99 (less than $7 a month), and you can add to them at any time, allowing you to always have the minutes you need. Add-on Data-only cards and text-only cards are also available online. You can learn more about it by visiting http://bit.ly/TFWireless. Won’t you join in and help fight the cause? Working together, we can all help to find a cure for Breast Cancer.